December 8, 1941 – The Japanese military attacked the Philippines 10 hours after they bombed Pearl Harbour in Hawaii. December 22, 1941 – The Japanese troops landed at the Lingayen Gulf and advanced across central Luzon towards Manila. December 25, 1941 – President Manuel Quezon advaiced General Douglas McArthur to declare Manila as an open city or delimilitarize the city to avoid destruction and removed the Commonwealth government to Corrigedor. January 2, 1942 – Manila was occupied by the Japanese. Gen. MacArthur then concentrated his troops on the Bataan peninsula to await the relief of reinforcements from the United States that, after the destruction at Pearl Harbour, could never come but then the Japanese suceeded in penetrating Bataan’s first line of defense. Then Gen. MacArthur retreated down the peninsula and went to Corrigedor. President Quezon and Vice-President Osmena left Corregidor by submarine to form a government in exile in the United States. March 11, 1942 – Gen. MacArthur escaped from Corrigedor (where he said his famous “I shall return” promise) in PT-41 bound for Australia and there he would plan to come back for the Philippines. April 9, 1942 – 76,000 American and Filipino soldiers in Bataan surrendered (also known as the Fall of Bataan) and the Japanese led them on the infamous Death March on which 7 to 10,000 died or or were murdered before the march ended. 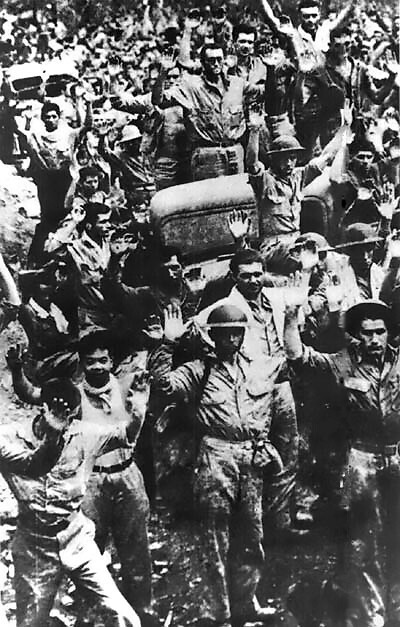 May 6, 1942 – 13,000 survivors on Corregidor surrendered. October 20, 1944 – Gen. MacArthur returned to the Philippines. The landings on the island of Leyte were accomplished massively with an amphibious force of 700 vessels and 174,000 army and navy servicemen. Through December 1944, the islands of Leyte and Mindoro were cleared of Japanese. 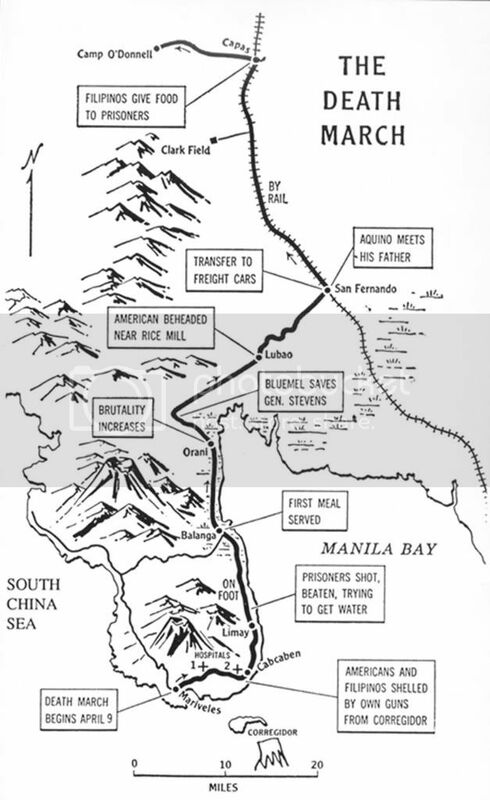 January 9, 1945 – The Americans landed at the Lingayen Gulf on Luzon and closed on Manila. They fought with the Japanese trying to clear them off from the city where it took almost a month and left the city in ruins specifically the Intramuros. They also cleared off Japanese garrisons in Palawan, Mindanao, Panay and Cebu. General Yamashita, the Tiger of Malaya, did not surrender in Baguio until September 2, 1945; the same day as General Umezu surrendered formally for Japan on board the USS Missouri in Tokyo Bay. The liberation of the Philippines was costly. In the Philippines alone, the Americans lost 60,628 men and the Japanese an estimated 300,000. Filipino casualties are estimated at over a million and, sadly, these occurred mainly in the last months of the war when the final outcome had long been decided in any event. The most serious long term consequence of World War II on the Philippines was to aggravate and embitter its internal social divisions. Prior to his departure for exile in the United States, President Quezon had advised Dr. Jose Laurel to stay behind and cooperate in the civil administration of the Japanese occupation. Whether it was good advice or not, President Quezon had hoped that with the cooperation of Filipinos, the occupation might be less severe. Following Laurel’s morally ambiguous example, the Philippine elite, with regrettably few exceptions, collaborated extensively with the Japanese in their harsh exploitation of the country. President Laurel and his wartime government was despised. On the contrary, the great majority of the Philippine people mounted a remarkably effective resistance to the Japanese occupation. Investigations after the war showed that 260,000 Filipinos had been actively engaged in guerrilla organizations and an even larger number operated covertly in the anti-Japanese underground. By the end of the war, the Japanese had effective control in only twelve of the country’s forty-eight provinces. The largest guerrilla organization was the Hukbalahap (People’s Anti-Japanese Army) led by Luis Taruc. He had armed some 30,000 guerrillas who controlled most of Luzon. By war’s end, the members of the resistance firmly believed that the widespread collaboration and corruption of the well-to-do had discredited the ruling elite and that they had thereby forfeited any moral authority to govern. The United States intended to restore the pre-war Commonwealth government. Luis Taruc and the Huks had well known socialist sympathies and communist associations. Despite their political affiliations, the Huks fully expected the American forces to treat them as allies and war heroes in recognition of their resistance and contribution to the war effort. Instead, the U.S. Army military police set out to disarm them as dangerous insurgents. MacArthur had Taruc arrested and jailed.